Delightful Chocolate On A Stick! 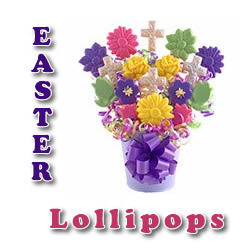 Surprise the kids with chocolate Easter lollipops this year! They are quick and easy to make, but full of fun and enjoyment for everyone. Who doesn't love a chocolate sucker? 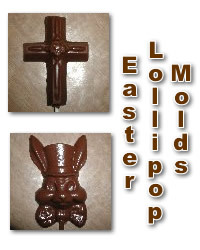 You can order ready-made lollipops for Easter if you don't have time to make your own Easter suckers, or if candy making just isn't "your thing." But for all the rest of you, who like getting your hands sticky (grin), you may as well go ahead and make your own Easter candy. Chocolate candy making with molds is not difficult at all, and it's a whole lot of fun! My favorite mold suppliers are Candyland Crafts because they have such a huge selection (over 2000 molds) and fantastic prices (most molds under $2.00). Browse through their online chocolate mold catalog and make a selection. Be prepared! If you're anything like me, you will have a difficult time choosing. The great thing is that chocolate molds are really inexpensive. You can get them for just $1.50-3.00 and sometimes even less on clearance items. I also love the fact that I can order the lollipop molds, the chocolate, the sucker sticks, and the cello bag covers all at one place. Melt the chocolate in a double boiler over hot water. You could also melt the chocolate in a microwave if you are careful and only heat in 30 second intervals, stirring thoroughly each time. Do not overheat. If you are making the lollipops for a very special party or to sell, you may want to take the extra time to temper the chocolate. Pour the chocolate into the chocolate Easter molds. Insert the sticks in the proper place, twisting them lightly to cover well and secure. Allow chocolate to set by chilling in the refrigerator or freezer until completely set. Tip molds upside down gently tapping on counter if necessary. Cover chocolate suckers with cellophane bags. Gather the ends around the stick and secure with a twist tie or colored ribbon. Ta da! You did it!